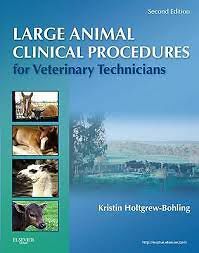 Covering the role of the veterinary technician in large-animal care, Large Animal Clinical Procedures for Veterinary Technicians, 2nd Edition provides a comprehensive guide to large-animal clinical diagnostic, medical, and surgical procedures. Not only does this book show why and how each procedure is performed, but it shows the vet techs role in preparing for, assisting in, and following up on each one. Coverage of herd health care helps you understand the essentials of behavior and handling, safety, breeds, vaccination schedules, and common parasites. This edition adds case studies and clinical applications in each chapter, and a new section with an overview on livestock management. Written by educator and horse stable owner Kristin Holtgrew-Bohling, this book helps you pass your boards and gain certification, and can also be used as an on-the-job reference.